(From Nikon lens literature) "Compact and lightweight, this affordable lens is an optimum lens to use with Nikon DX-format digital SLR cameras and is the ideal focal length as a ''first lens'' to faithfully capture life's day-to-day moments, or a welcome addition to a Nikon D-SLR photographer's already-established lens assortment." 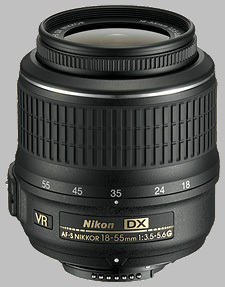 The 18-55mm ƒ/3.5-5.6G VR was introduced in December 2007 as a new kit lens for the Nikon D40 and D40X cameras. It's easy to dismiss this lens as ''the old kit lens plus VR,'' but in fact Nikon has reconfigured the lens design, replacing and re-arranging a variety of lens elements. Nikon has added four elements, going from 7 elements in 5 groups to 11 elements in 8 groups. There is still one aspherical element, but Nikon has dropped the ED element in favor of the new VR group. On a Nikon digital body with an APS-C sized sensor, the lens will give an effective field of view of approximately 28-80mm. The lens vignettes when mounted on a full frame body; you'll see black corners with the lens set to below 24mm. As a G-series lens, there's no aperture ring, so it may not work properly on a film body that can't set the lens aperture. Dealers tend to make the lens available as part of a D40, D40X or D60 body and lens kit, or on its own for around $200. The 18-55mm ƒ/3.5-5.6 won't win any prizes for sharpness, but it's not bad, either. I suppose if this lens were magically sharp, there wouldn't be an incentive to upgrade. Our copy of this lens seems to be slightly decentered, which actually gives some interesting insights regarding corner sharpness. As with most lenses the optimal results are achieved when stopped down - in the case of the 18-55mm VR, to ƒ/8 or ƒ/11. Best results for sharpness seem to be achieved with the lens set to wide angle (18mm) and ƒ/11, where sharpness is excellent across the entire frame, between 1 and 1.5 blur units. At other focal lengths and apertures, we see some evidence of corner softness, but the central region is still quite sharp. There are some odd deviations from otherwise stable image sharpness, for example at 18mm and 35mm you get fairly consistent results, but at 24mm there are some large spikes of corner softness. This might not be an issue with a properly centered lens - or at least not really visible - but it's definitely something to look out for, and may speak to sample variation. For example, at 24mm and ƒ/4, we see upwards of 6 blur units on the right corners. To the lens' credit, diffraction limiting sets in only at ƒ/22 or greater, meaning ƒ/16 is actually quite usable. Images sharpness is above average, even fully stopped down, at 4 blur units pretty consistently across all focal lengths. In summary, for the money, it has more than acceptable results, especially for a plastic kit lens. The lens shows good resistance to chromatic aberration, much improved over the previous version of the 18-55mm. This is noteworthy as Nikon removed the ED glass element, in favor of an improved lens coating. Chromatic aberration is present at the wide angle (18mm), consistently in the corners and overall as the aperture is stopped down, but as the focal length increases chromatic aberration all but disappears by 35mm. Nikon is definitely ahead of the game when it comes to dealing with CA. Where the previous version of the 18-55mm showed significant corner darkening only at 18mm (over a stop darker in the corners), the VR version shows less at 18mm, but vignetting is now seen at all focal lengths where the aperture is set to between ƒ/3.5 and ƒ/5.6. With the previous version, vignetting was a non-factor if you used a focal length other than 18mm. However, we're only talking about 2/3 of a stop in the worst case scenario (18mm and ƒ/3.5); in other focal lengths wide open we see a half-stop darker in the corners than the center. By ƒ/8, corner shading has disappeared (less than 1/4 stop). The 18-55mm ƒ/3.5-5.6 VR is optimized for non-distorted results at 35mm and above. Wider than that, distortion is of the barrel (''bloat'') variety, reaching a full 1% distortion in the corners. Fortunately, it's uncomplicated distortion that's easy to correct in image post-processing software. Despite being an AF-S lens, the 18-55mm ƒ/3.5-5.6 is relatively slow to autofocus. Our non-scientific testing puts it at over a second to rack through near-far focus on a D60 body. Manual focus is selected with a dedicated AF/MF switch; despite being listed as an AF-S lens, you can't override autofocus by just turning the focus ring; you have to switch to manual focus mode. In this case, the AF-S term just means the focus motor is built into the lens. Macro results are fair for this lens, with a magnfication of 0.31x, and a close-focusing range of 28cm (3.5 inches). The 18-55mm ƒ/3.5-5.6 is a plastic lens, with no metal lens mount or filter ring. As an advantage this makes the lens very light (265g, 9.3oz) and easy to handle; however, it doesn't feel as robust as Nikon's more expensive lenses. It doesn't feel cheap; it just doesn't feel as ''solid'' as I would expect. The lens has an optional lens hood, the HB-45. It's a circular (non-petal) shape that clips on, but to its credit, the lens responds well to strong light sources, not producing much in the way of flare, so I would say it's not a necessary option. The lens takes 52mm filters: these will rotate during focusing. The zoom ring is about an inch wide, with well-textured raised rubber ribs. It provides a nicely spaced zoom selection, rotating 90 degrees through its range. 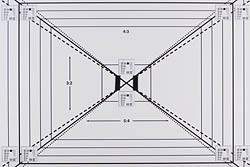 The lens will extend about a half-inch during its zoom range, but is at its smallest when set to 30mm. Zooming action is very smooth but nicely dampened; the lens won't creep at all. The focus ring on the newer kit lenses has never been great, and the 18-55mm VR hasn't improved. It's a thin ring with indented plastic ribs, providing only 45 degrees of travel. It will only allow manual focus if you've selected that mode; it's not impossible to achieve accurate manual focus, but it's definitely harder than it needs to be. Clearly, this is a lens that's not intended for anything but autofocusing. That said, autofocus, while dependent on the body, is very accurate. The Vibration Reduction system on the lens seems to be a simplified version; I'm sure Nikon would say if it was VR2. There is only a switch to enable and disable the VR system, and no switch to select between Active and Normal VR. Nikon advises turning off VR on a tripod, but using it for a monopod. As an aside, I must say that adding VR to a 18-55mm lens seemed a bit puzzling to me at first; Canon started it by adding their Image Stabilization technology to their 18-55mm kit lens, and Nikon followed suit by upgrading their kit lens with VR. When set to wide-angle, one really doesn't need vibration reduction unless the shooter has very shakey hands. It's when you get to 55mm and the maximum aperture is ƒ/5.6, that VR makes sense. I imagine it was one extremely common shooting situation that prompted it: the ''blowing-out-the-candles-on-the-birthday-cake'' shot. Low-light closeups with ƒ/5.6? A recipe for camera blur. I'm guessing both Canon and Nikon were motivated to put VR into the lens because it's cheaper and simpler in comparison to building an economical 18-55mm ƒ/2.8. In practice, the VR system works very well. Nikon's literature suggests the user can shoot at three stops slower than required and still get sharp pictures, and our own usage suggests that's true. There are quite a variety of lenses that cover this focal range, not only in Nikon's collection, but in Sigma and Tamron collections. I have been fairly conservative in presenting alternatives. Also Nikon 18-55mm ƒ/3.5-5.6G ED II AF-S DX. The previous D40 kit lens, optically it's about the same - slightly sharper even, but worse for CA. Better results for vignetting, the same for distortion. The classic modern kit lens, before Nikon provided cheaper alternatives, the 18-70mm is optically as good or better than the 18-55mm, but doesn't come equipped with VR. At over three times the price, you'd expect the 16-85mm to be better, and you'd be right. Sharpness, CA are hands-down better; vignetting is about the same, but distortion is a bit more complex. Also has VR. This Sigma option has been re-tooled with HSM to allow for operation on D40/40x/60 bodies; optically it's a little better than the 18-55mm, but doesn't come with VR. It does come with pretty good macro capability, and is slightly faster at the wide end. The Sigma comparable doesn't go as telephoto as the Nikon, neither does it have VR. We haven't tested it, but at the same price as the previous (non-VR) Nikon 18-55mm, between the two, you're probably better to go with the Nikkor. The chances are, if you bought a Nikon D40x or D60 in 2008, you already have this lens. I can't see a compelling reason to buy this lens separately unless you're really strapped for cash; there might be some on the used market as people upgrade to the more capable 18-200mm or 16-85mm VR lenses. Optically it's alright, maybe even better than alright if you get a good copy, but to get the best results you have to stop down to ƒ/8. Fortunately, the addition of VR does make that possible. In the final analysis it's a good lens, not a great lens, excellent for the beginning photographer. This lens should be in your camera bag if you like simple blur-free photographs. The VR is superb. It is super-light and sharp. Fine on my D300 and D3100 cameras when I don't want to carry a heavy zoom and the results are perfect in good light conditions. Perfect holiday/travelling lens. Use a rubber hood to protect it from knocks. This is KIT lens for low level Nikon cameras. I have used it for around 6 month and can confidently say that it is excellent lens for a KIT. Many starters look for another lens from a very beginning or purchase body only + expensive zoom, but I don't think it is good idea. For a very small price you get decent image quality and good opportunity to learn what would you need in future: tele lens or wide angle, faster apperture or better VR, portrait or macro. 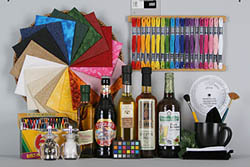 You will find you photography style and buy better lens in your selected niche. Ideal lens for a starter.